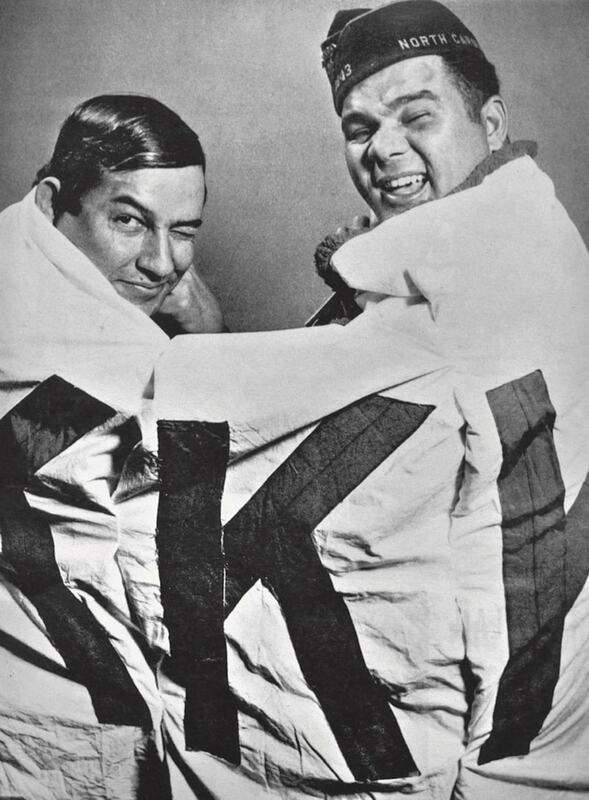 Charlie Warriax (left) and Simeon Oxendine (right) bear a captured KKK banner. Courtesy of the Charlotte Observer Photograph Collection, Public Library of Charlotte and Mecklenburg County. This essay draws on research that will appear in The Lumbee Indians: An American Struggle, University of North Carolina Press, forthcoming Fall 2018. I first heard this story when I was probably eight or nine years old—old enough to know what the Ku Klux Klan was and why it was so dangerous, but young enough to believe the story had clear heroes and villains. My family and I are members of the Lumbee Tribe of North Carolina, the largest Indian tribe east of the Mississippi, headquartered in the southeastern part of the state. I was born there, in Robeson County, but my parents raised me in Durham, where they taught at North Carolina Central University, one of the state’s 12 historically-Black colleges and universities. Between my African-American elders at NCCU and my Lumbee elders at “home” in Pembroke, I grew up with several different versions of the Civil Rights struggle to inspire me. This particular story comes from the Lumbee side, but its lessons are for everyone. My father’s cousin, Simeon Oxendine, first told me about how the Lumbees organized armed resistance to the Klan in 1958. Following Brown v. Board of Education and several years of rising violence and political tension, everyone began to see that Jim Crow might one day die, though it would be a long and painful struggle. In North Carolina, the Ku Klux Klan used violent intimidation and baseless appeals to racial purity to keep Jim Crow on life support. But when the Klan came to Lumbee territory to show off their power, Lumbees got together and taught them a lesson about power that they’d never forget. We called my dad’s Oxendine cousins “Uncle” or “Aunt,” terms of affection and respect. Uncle Sim was a key player in these events, and he first told me and my little brother this story on his back deck in Charlotte, North Carolina. I remember being awed at the bravery of our Lumbee people. Before this, I had thought the Klan could not be challenged. I saw them as powerful villains; I didn’t realize they could be scared, and then neutralized. Years later, as a historian, I’m able to see more than the good or bad in these actions. And, although the theme of good-vs-evil is more complicated than I once thought, I see clearer relevance to our own present moment. In the wake of neo-nazi violence in Charlottesville, and anti-racist victories in Durham and in Murfreesboro, our generation wrestles with questions that my Lumbee and African-American elders addressed long ago: When is violence justified? What do we do when oppression masquerades as free speech? What can happen when the targets of white supremacist violence take violence into their own hands, and when law enforcement protects those who are actually oppressed, rather than those who simply believe they are oppressed? Before this, I had thought the Klan could not be challenged. I saw them as powerful villains; I didn’t realize they could be scared, and then neutralized. These questions resonate differently depending on where you are located in the power relations that define our society. Since the beginning of the African slave trade, Lumbees have occupied an ambiguous place within a region obsessed with racial dichotomy and the separation between Blacks and whites. Groups that do not fit neatly into this false dichotomy have developed their own special strategies in the long war for justice. And, they have been courted by proponents of white supremacy, including North Carolina’s famously “moderate” politicians who, after the Civil War, sometimes rejected the Klan’s violence but nonetheless shared the goals of maintaining segregation and white authority. For example, at the very dawn of Jim Crow, in the 1880s, the state legislature created Indian-only schools in a bid to draw Lumbee support from the Republican Party—then the party most open to empowering people of color—to the Democrats, who openly avowed white supremacy. This was tempting, as Indians believed that having their own schools would sustain their independence, and mitigate the destructive influence of white supremacy, at least to a degree. Economically, Lumbees had few options other than farming, and they suffered much the same oppression that poor farmers everywhere in the South experienced. But when it came to religion, family, and land, Lumbees exercised greater power and autonomy, and were, generally speaking, more successful at keeping white authority at bay. When the Klan came to Lumbee territory to intimidate the Indians, it specifically intended to challenge Lumbee independence in these spheres. Accordingly, it faced stiff resistance. What can happen when the targets of white supremacist violence take violence into their own hands, and when law enforcement protects those who are actually oppressed, rather than those who simply believe they are oppressed? And I looked, and rose up, and said unto the nobles, and to the rulers, and to the rest of the people, Be not ye afraid of them: remember the Lord, which is great and terrible, and fight for your brethren, your sons, and your daughters, your wives, and your houses (1). My Uncle Sim was far from the only hero of this story. There were many Nehemiahs that night. When the Klan gathered in Lumbee territory in 1958, it wasn’t the first time. Indian farmer Sanford Locklear recalled seeing hooded Klansmen in a field near his home back in the 1930s, when he was 16 years old. Later, when retelling the story, Locklear recalled his father’s halting voice struggling to explain what was going on. “He said, ‘When they gather like that… they talk about…’ He said, ‘Sometimes they go to people’s house and beat them.’” This was a difficult truth to convey to a young son—that the Klan beat people like him. Sanford asked why didn’t somebody stop them, and his father said, “It’s their land. They’re having meetings on it. They can do what they want to do” (2). In many ways, the racial situation in Robeson County had not changed much by the early 1950s. But in 1954, nearly 5,000 white workers lost jobs in textile mills across piedmont North Carolina, causing an economic crash for white families and a coinciding rise in attendance at Klan rallies. Three years later, the Klan’s new Grand Dragon, James “Catfish” Cole, began a publicity campaign in the Union County town of Monroe, where NAACP activists led by Robert F. Williams had been pushing to end the system of separate and unequal in the town’s public facilities. In retaliation for the NAACP’s civil rights work, Cole led a full-scale armed assault on the home of a Black doctor in Monroe. In a brazen show of support, county sheriff’s deputies escorted the Klan caravan to the doctor’s home. Williams and about 60 armed Black men had been guarding Perry’s home for weeks, so they were prepared—when the Klansmen opened fire, Williams and 60 men fired right back, driving Catfish Cole and his minions away in a haze of humiliation (3). The Klan continued its intimidation, moving to different targets. In the first weeks of 1958, a Lumbee family staggered out their front door in the middle of the night to find a fiery cross in their yard. The family had recently moved into a white neighborhood in Lumberton, the county seat, and this attracted the ire of Cole’s Klansmen, who were dedicated to enforcing segregationist ideals of white ‘purity’. The same warning—a flaming cross—was given to a white woman from a nearby town for dating an Indian man. In the press, Cole announced his desire to “put Indians in their place, to end race-mixing.” He said, “I am for segregation” (4). But, for centuries, Lumbees had been crossing the racial lines constructed by whites. They believed they were as good as white people, and that they could live in any neighborhood they could afford or date anyone they wanted. And, more deeply, their very existence as Indians belied the “truth” of white supremacy and the binary structure of race-based segregation. Segregation depended on reducing everyone into one of two categories—white or Black. Anyone else was, by definition, an affront to the system. Even though Lumbees were not openly advocating to end segregation in their schools, Cole targeted them anyway, to demonstrate the Klan’s commitment to protecting white supremacy. Following the cross burnings, Catfish Cole announced a Klan rally for Saturday, January 18, 1958, at Hayes Pond near the town of Maxton. As with other gatherings, Cole encouraged his followers to come with guns. As word of the rally spread to Klan members, it also spread through Lumbee communities. Sanford Locklear heard about it at a barbershop in Pembroke. He recalled some of the men wanted to confront the Klan, saying, “Let’s meet them in Maxton; let’s not give them the chance to come to Pembroke” (5). With the proposed gathering, the Klan wasn’t merely insulting Indian people; its presence would infringe on Indian land. Even though Maxton was only 10 miles away, few Indians lived in town and they didn’t consider it an Indian place. Rather than allow Klansmen to meet and then caravan to Indian homes near Pembroke, the way they had done in the assault on Williams in Monroe, these Indian men decided to ambush the Klan outside Lumbee territory. There was no way they were going to let Catfish Cole on their land. Robeson County sheriff Malcolm McLeod drove to Cole’s home in South Carolina and asked him to cancel the rally. The year before, in Monroe, police cars had escorted Klan demonstrations, but McLeod promised Cole no such protection. The day before the planned rally, Maxton’s police chief told a reporter that he didn’t want “outsiders” like Cole to “stir up trouble” in otherwise “good race relations.” The Robeson County sheriff warned that Indians planned to kill Cole if he spoke at the rally (6). Cole did not heed the sheriff’s warnings. That night, about 50 Klan members drove to Hayes Pond and circled their cars; Cole set up a small generator, a PA system, and a lamp. Most of Robeson County’s Klan members stayed home; the 50 Klan members, women, and children at the rally were part of Cole’s following from South Carolina. Soon they were surrounded by 500 Indian men, many of whom were U.S. military veterans, and about 50 Indian women. Many were armed with rifles, shotguns, pistols, and knives. I asked him what was he doing there. He said, “We come to talk to these people.” I said, “Well, you’re ain’t gon’ talk to these people tonight.” He said, “Yes, I am.” I said, “No, you ain’t.” And so words was exchanged, you know. And about that, about that time, I pushed on him and pushed him back, and I throwed the gun on him. I pushed him, you know, and I throwed the gun on him. And I told him not to move. “And don’t you move; if you do, well, I’ll kill you,” that’s what I said. And he had his light up there. My brother-in-law shot, he shot his light out, and when he shot the light out, I kicked his tape player, recorder. At that moment, the Indian crowd erupted, firing guns into the air and roaring. Cole took off running into the swamps. His panicked followers dropped their guns, jumped in their cars, and drove in all directions—some straight into the ditches surrounding the field. Cole abandoned his own wife, Carolyn, at the scene. She either escaped on foot with her three children or, as some Lumbees tell the story, drove her car into a ditch and had to have Lumbee men pull her out (8). Miraculously, no one was seriously injured, even though Sanford Locklear’s threat to kill Cole was real. “I am still puzzled that no one got killed,” said one of the women who confronted the Klan (9). Catfish Cole didn’t come out of his hiding place for two days. The Lumbee response was both euphoric and measured. The night of the rally, my Uncle Simeon Oxendine, a Hell’s Angels veteran and son of Pembroke’s mayor Sonny Oxendine, seized the KKK’s flag with fellow veteran Charlie Warriax. With the crowd, they set up a bonfire in Pembroke, where they burned Catfish Cole in effigy. The next day, the two men traveled to Charlotte with the flag, and a newspaper took a picture of them, wrapped in it, winking at the camera. The nation’s most threatening organization seemed thoroughly routed. You came with a gun. Obviously you did not bring goodwill. Our people can’t understand why you would want to come among a happy people and… create discord. [We] want to create a community that would be an asset to our nation…. If your organization had something worthwhile to offer, we would be happy to have you. But the history of your organization proves that it has nothing to offer. Later, both Catfish Cole and James Martin faced additional civil and criminal charges in the Robeson County Superior Court, including inciting a riot. In a Lumberton courtroom filled with 350 Indian onlookers, the prosecutor told the jury, “Gentlemen, you had better stop this. If you don’t, there will be more bloodshed.” Gesturing toward the Indian audience in the courtroom, he continued, “If you think you can take [any] Kluxer… and drive that crowd around, you’ve got another think a-coming”(11). The next day, the all-male, all-white jury took 43 minutes to return guilty verdicts for both Cole and Martin. The judge gave Cole the strongest possible sentence, 18 to 24 months on the chain gang, and handed Martin a lighter sentence, which also included prison time. When asked why he voted to convict, one jury member told a reporter, “People from out of this county came here with shotguns—and they didn’t come bird-hunting”(12). Defiant, Cole promised more rallies, but Martin said he was leaving the Klan (13). Cole never did organize any more rallies in Robeson County, and if the Ku Klux Klan has held any there since 1958, they have not been publicized. On local, state, and national levels, white observers struggled with the question of who should be properly identified as the aggressor in this incident. North Carolina Governor Luther Hodges blamed Cole and his cohort, saying “The responsibility for the Maxton incident rests squarely on the irresponsible and misguided men who call themselves leaders of the KKK”(14). Nevertheless, the Washington Post ran an editorial called “Cowboys and Indians,” asserting that the Klan acted within their First Amendment rights and that Indians used mob action to interfere with the Klan’s threats. While expressing sympathy for the “Indian braves” who the Klan repeatedly threatened, the editorialist emphasized that “by taking the law into their own hands [the Indians] encouraged lawlessness of the very sort that the Ku Klux Klan embodies”(15). An irate reader of the local newspaper, the Robesonian, heaped scorn on Indians. She wrote that “Chief ‘Heap Big Mouth’ Oxendine” deserved the same charge for inciting a riot (she was probably referring to Pembroke’s Indian mayor, Sonny Oxendine). “There are thousands of white people who feel about it almost like the KKK do,” she asserted. In conclusion, she blamed the media: “This week [the papers] ought to print the Palefaces’ side”(16). Similar to today’s defenses of white supremacist bullying, Cole’s and Martin’s defense attorneys argued that their clients were simply exercising their right to free speech at the Klan rally. The jury obviously did not agree. And it’s fair to say that the Indians didn’t think about the Klan’s First Amendment rights too much. After decades of being denied those rights themselves, they were hardly anxious to exercise constitutional fair play. Yet clearly the Indians were aggressive and could justifiably have been charged and sentenced under any number of statutes. Nonetheless, locally, regionally, and nationally, whites offered support to the Lumbees, even though that support did not acknowledge their full humanity, or their rights to defend themselves with violence. Rather, that support served to affirm white authority and the laws it upheld. Much of the white South saw itself as under assault—and Catfish Cole’s actions reflected this mood. Even North Carolina’s “moderate” politicians were not so very different; they certainly did not rush to integrate schools. But, they supported the Lumbees because that was the safe, even conservative thing to do, since it deterred further violence. Moreover, siding with the Lumbees, after the fact, had a double advantage: it made the state government’s own inaction on racial equality look progressive in contrast to the Klan’s stance, and it positioned the government as the defender of order in contrast to the Klan’s unlawfulness. In this context, law enforcement and politicians did not do Lumbees any favors—indeed, they had inherited and in most cases eagerly perpetuated the systems that prevented Lumbees from access to equal opportunities. From the local sheriff up to the governor, self-interest ironically dictated support for a group whose needs they otherwise ignored. As a result, the Klan could not win, but the forces of white supremacy were unshaken. Siding with the Lumbees, after the fact, had a double advantage: it made the state government’s own inaction on racial equality look progressive in contrast to the Klan’s stance, and it positioned the government as the defender of order in contrast to the Klan’s unlawfulness. How to defeat these forces, once and for all? To Lumbees, the perceptions of outsiders did not matter—whether they were Klan members activated by violence, law enforcement driven by order, or politicians seeking to forestall change, they had no business in Lumbee land or interfering with Lumbee families. At Maxton, Lumbees confronted a specific form of terror, a hatred they knew well, with equal measure. They had confidence in the experience and self-control they brought from centuries of defending their territory. And, of all the lessons learned throughout those centuries, that night Lumbees brought a respect for the love that reigns from a great and terrible God, and a strong vision for the American nation they had co-created. As Judge Lacy Maynor told Catfish Cole, in a courtroom over which he presided while the Klan Dragon was on trial, the Lumbees acted with a sense of purpose, to be an asset to the nation. The same cannot be said for the white supremacists, back then or today, who bring no love, respect, knowledge, or reverence for anything but an outdated sense of their own significance. 1.Neh. 4:14, King James Version. 2.Jefferson Currie II, “The Ku Klux Klan in North Carolina and the Battle of Maxton Field,” Tar Heel Junior Historian, Fall 2004, 1. 3.David Cunningham, Klansville, U.S.A.: The Rise and Fall of the Civil Rights-Era Ku Klux Klan (New York: Oxford University Press, 2013), 32; Timothy B. Tyson, Radio Free Dixie: Robert F. Williams and the Roots of Black Power (Chapel Hill, N.C.: University of North Carolina Press, 1999), 60-61, 88-89. 4.“Bad Medicine for the Klan: North Carolina Indians Break Up Ku Klux Meeting,” Life, January 1958, 28. For details of the incident, which vary, see Dial and Eliades, The Only Land I Know (Syracuse, N.Y.: Syracuse University Press, 1996), 159-62; Karen Blu, The Lumbee Problem: The Making of an American Indian People (Lincoln, Neb. : University of Nebraska Press, 2001), 156-60; Tyson, Radio Free Dixie, 137-40; Frye Gaillard and Carolyn DeMerritt, As Long As the Waters Flow: Native Americans in the South and East (Winston-Salem, N.C.: John F. Blair, 1998), 155-7; “An Indian Victory at Hayes Pond,” Native Visions 3 (January 2008), 4; Lorraine Ahearn, “Narrative Paths of Native American Resistance: Tracing Agency and Commemoration in Journalism Texts in Eastern North Carolina, 1872-1988” (Ph.D. dissertation, UNC-Chapel Hill, 2016), chapter 3. 5.Currie, “The Ku Klux Klan in North Carolina,” 2. 6.“Maxton Ku Klux Rally Plans Provoke Threats of Violence,” News and Observer, January 17, 1958. 7.Currie, “The Ku Klux Klan in North Carolina,” 2. 8.Ahearn, “Narrative Paths of Native American Resistance,” 127, 184. 10. Bloys Britt, "Judge Deplores Klan Entry Into Peaceful Indian Land," Robesonian, January 22, 1958, 1. 11.“Cole Case Is Slated for the Jury Today,” (Burlington, N.C.) The Daily Times-News, March 13, 1958, 1. 12.“Judge Gives Cole Long Road Term,” The Daily Times-News, March 14, 1958, 1. 13.“Cole Plans More Rallies By Klansmen,” The Daily Times-News, 14 March 14, 1958, 1. 14.Quote from letter on display in an exhibit about the “Battle of Maxton” at the Native American Resource Center, UNC-Pembroke, Pembroke, N.C.
15.“Cowboys and Indians,” Washington Post, reprinted in Robesonian, January 28, 1958. 16.Sara Adcox, “Raps Press and Sheriff For Way Maxton Clash Handled,” Robesonian, January 28, 1958. Malinda Maynor Lowery teaches Native American history at UNC-Chapel Hill and is Director of the Center for the Study of the American South. She is a member of the Lumbee Tribe of North Carolina, born in Robeson County and raised in Durham. When I remember what a privilege it is to have a place, any place, in the web of existence on this planet, I return with humble gratitude to the awe-inspiring, primal fact of the moment: I am alive, I am part of this place, part of the totality. People still live in the place that was Soul City. The sign is still there, but the promises are gone.